Baltimore, MD - The Blast recorded their twelfth victory of the season behind a six goal first quarter, to keep pace with rival Utica City for the Eastern Division title. The Blast got off to a quick start as Jonatas Melo passed the ball of the boards to Vini Dantas, who scored his team-leading sixteenth goal of the season. The goal came after only twenty two seconds of play. Vini Dantas would grab his second goal of the game after another Jonatas Melo assist to give the Blast a quick 2-0 lead. The Blast continued to use the boards early and often, as Andrew Hoxie played a ball off the board to Jonatas Melo, who gave the Blast a 3-0 lead. The Blast would continue to pile on the pressure as Tony Donatelli and Vini Dantas would each add a goal to make the score 5-0. A Kansas City goal from Kevin Ellis would put the Comets onto the board, but the Blast regained the five goal advantage with seconds remaining through Jon Orlando. Jonatas Melo would close out the first quarter with four assists and the Blast would lead 6-1. Leo Gibson would start the second quarter with a Kansas City goal within the first minute to make the game 6-2 Blast. Ibrahima Keita would immediately respond with the Blast's seventh goal of the game as he stole the ball from Kansas City and ran the length of the field to put the ball past the goalkeeper. Leo Gibson would answer right back and score his second goal of the game to cut the Blast's lead to 7-3. Kansas City was awarded a penalty shot for a foul on William Vanzela. Gibson would put the ball past Vanzela to cut the lead to 7-4. Midway through the second quartr, Kansas City would grab their fifth goal of the game from Kevin Ellis to make the score 7-5. James Togbah and Leo Gibson would score for Kansas City while Adriano Dos Santos would score for the Blast to make the score 8-7 going into halftime. The second half started with a slower scoring pace with the first goal being scored by Vini Dantas with nine minutes remaining in the third quarter. Dantas scored his fourth goal of the afternoon to give the Blast a 9-7 lead. Kansas City would answer back with a goal from way outside the box by John Sosa. The Blast would head into the fourth quarter with a 9-8 lead. Vini Dantas would score his fifth goal of the game early in the fourth quarter to give the Blast a narrow two goal lead. Ramone Palmer would shrink the deficit to 10-9 for Kansas City with seven minutes remaining in the fourth quarter. The Kansas City Comets put on their sixth attacker with two minutes remaining in the fourth quarter. The Blast defense would be able to hold off on the best offenses in the league for the remaining two minutes to get a crucial 10-9 victory. Jonatas Melo led the Blast in scoring with a staggering six points off one goal and five assists. Vini Dantas tallied five points on five goals in the Blast victory. Leo Gibson led the Comets in scoring with six points from four goals and two assists. William Vanzela recorded nineteen saves in a very busy day for the Blast goalkeeper. The Blast sit one game back from Eastern Division leaders Utica City FC. 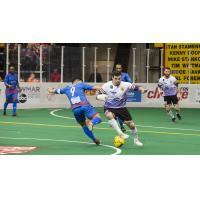 The Blast visit rival Harrisburg Heat on Sunday March 17th at 5:05 P.M. as they look to clinch a playoff spot for the twelfth consecutive season.